Smash Bros., and Fortnite, and Mario Party, Oh My! For the sixth year in a row, Nintendo delivered their E3 presentation in the form of a direct video released online. As expected the direct focused almost exclusively on games releasing in 2018 but there were a couple of 2019 games featured as well. Let’s dive in! The direct kicked off with a stylish mech-action game called Daemon X Machina. The trailer showed off fast gunplay and a variety of different larger than life enemies, as well as some sword-based combat. There wasn’t much information given about the game but it is one of the few games in the direct that is releasing in 2019. Next, Nintendo announced a new DLC expansion for Xenoblade Chronicles 2, entitled Torna-The Golden Country, which features some added story. The expansion will be arriving at some point this summer and is available as part of Xenoblade Chronicles 2‘s season pass subscription. Another game that was announced prior to E3, Pokemon Let’s Go received a new trailer that shed some light on the gameplay for the upcoming title. Nintendo of America President Reggie Fils-Aime showed off the Poke Ball Plus accessory, highlighting that you can play the entire game using the attachment. He also revealed that legendary Pokemon Mew comes with the purchase of the accessory. Pokemon Let’s Go Pikachu and Pokemon Let’s Go Eevee launches on November 16th, 2018. 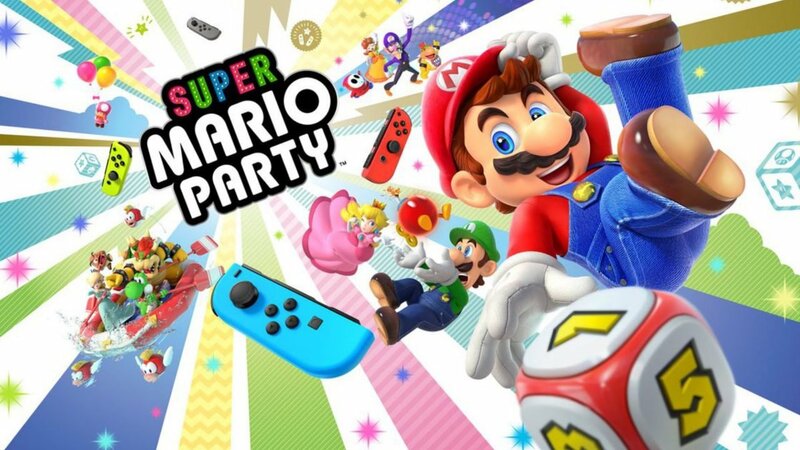 A new Mario Party game named Super Mario Party was shown off, and it focused on utilizing multiple Nintendo Switch consoles to play local multiplayer. The trailer featured a bevvy of mini-games, including one where players positioned their Nintendo Switch consoles in different ways to build a battlefield and then proceeded to take part in a tank fight on the created terrain. The game launches on October 5th, 2018. The first trailer for Fire Emblem Three Houses was also revealed in Nintendo’s presentation and it already stands out as the best looking Fire Emblem game to date. The game features all-new characters, including a protagonist named Byleth, and a story that involves a Goddess trying to keep balance in the world. While it’s not quite clear exactly what the conflict in the game is, there definitely is lots of it. The game is set to launch at some point in the Spring of 2019. The worst kept secret of E3, Fortnite’s move to Nintendo Switch was leaked well before the conference, but it is nonetheless an exciting announcement. And it’s available right now! The Switch version of the game seems to support four player local play and will contain all the bells and whistles of the other console versions. Another game that was leaked before E3, Overcooked 2 adds new features such as the ability to throw ingredients around the kitchen, and maps that change throughout levels. The game launches on August 7th, 2018. One of the most unique games shown off during the direct, Killer Queen is a port of a real-life arcade cabinet game. The game is a real-time strategy platforming title that features intense multiplayer action. It will also be a timed exclusive on the Nintendo Switch and will launch at some point this winter. Previously released on Steam, Hollow Knight is a side-scrolling exploration game with a beautiful painted art style. It received mass acclaim since its launch in 2017 and similarly to Fortnite, the game is available right now on the Nintendo eShop! During the Direct, Nintendo showed off a montage of other games and updates that are coming to Nintendo Switch this year. These titles include: Octopath Traveler, Starlink, Arena of Valor, Minecraft, Dragon Ball Fighter Z, Splatoon 2 DLC, Captain Toad Treasure Tracker, Crash Bandicoot, Ninjala, Asmodee Digital, FIFA 19, Ark, Wastelands , Paladins, Fallout Shelter, Dark Souls Remastered, Monster Hunter Generations, Wolfenstein 2, Megaman 11 and Mario Tennis Aces. The most anticipated trailer to come out of Nintendo’s showcase was easily the new Super Smash Bros. game and it didn’t disappoint. Masahiro Sakurai talked about the upcoming game and especially focused on the game’s character roster. The big feature this time around is that every single fighter in Super Smash Bros. history is playable in Super Smash Bros. Ultimate. That includes DLC characters and those that only appeared in one game like Snake. Sakurai also noted that the starting roster will be small and that characters will be unlocked gradually throughout the game, which he hopes gives players a sense of accomplishment. Another significant change is that all characters with drawn-out Smash moves have been reworked so that fights are faster. For example, Fox and Falco’s Landmaster has been replaced by a quick firing explosive move that resolves in a matter of seconds. Also in time battle mode, the fighter in the lead will glow occasionally, allowing for other players to focus on taking them down. As for new characters, there were only a couple introduced but they definitely pack a punch. Inkling from the Splatoon series is being added to the Smash Bros. family and the character uses its classic Splattershot, and Splat Roller weapons, alongside its Killer Wail smash move. Daisy has also been added as an echo character to Peach and the two have slightly different physics, but similar attacks. Lastly, the biggest character announcement was easily Ridley from the Metroid series. Fans have been asking for its inclusion for a while, and from the limited footage that has been shown off, it’s clear that the character packs a punch. Super Smash Bros. Ultimate will launch on December 7, 2018. Stay tuned to CGMagazine for all the latest updates from E3 2018. Check out our coverage of Sony’s Conference and Microsoft’s E3 Presentation.